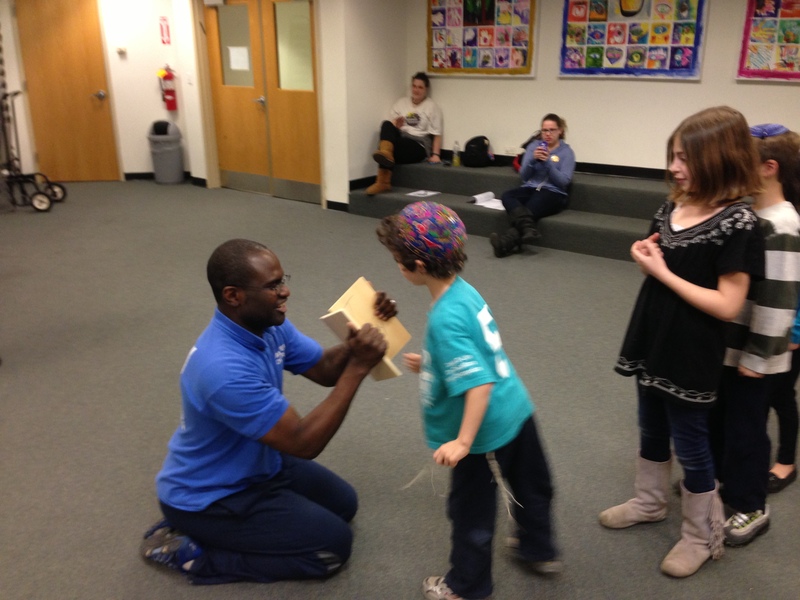 Yesterday I took my boys to an hour and a half class at a local synagogue entitled “Bully Proof”. It was taught by Taekwondo instructor Master Edwards. It was part of whole day Festival of Kindness in commemoration of the Holocaust. Master Edwards started by explaining the basic power dynamics of bullying. He went on to equip the children with some simple techniques to evade getting bullied. He asked them to affirm the comments that people say about them and then leave, laugh it off and leave, and finally to say “ Stop” and leave. To practice their responses Master Edwards brought some 12 year-olds to play the role of the bully. I was listening attentively to what the “bully” said to Yishama. First he commented on his large head of hair, then his large colorful Bukharin Kippah, and then of course his Tzitzit. While Yishama did exactly what he was supposed to do with great aplomb, I was deeply saddened. What have I done to my children? Bullies feed on difference, singling out people who look or act different from themselves or the larger society. Have I marked my children to be bullied? What have I done to this poor little 6-year-old with a Jew-fro, huge colorful head coverings, and the flowing strings coming out of his pants? And yes, the fact that it is Yom HaShoah was sitting heavy in my consciousness. Master Edwards ended the session by inviting each child to come up to the front, make a proclamation about themselves, and breaking a board with their fist. Each child came up and affirmed something deep about who they are and who they aspire to be. One said I am important, another said I am extraordinary, another I am significant, and yet another said I am magnificent. When it came time to Yishama to make his affirmation he came up and said, “I am a Robot.” Master Edwards asked him to say something meaningful about himself. Without missing a beat Yishama responded, “I am Jewish” and broke the board. On the way home I asked him what it meant to affirm that he is Jewish. Being Jewish did not mean what I had feared it might have meant. Yishama responded, “It means that I have confidence.” Today is not just a day to remember the Holocaust, it is Yom HaZikaron laShoah ve-laG’vurah “Holocaust and Heroism Remembrance Day”. We should never forget the martyrs and the heroes. It is critical to remember how we lived as Jews with honor and pride, not just how we died. I have confidence that Yishama is “bully proof” and a hero for me. There are many questions we can ask about these stones. Are these stones built as a cause or an effect of their entering into the land? And an even simpler question, which direction did these stones face? Were they facing the residence in the Land or their neighbors? Reflecting on these questions I think about my daily commute into New York City. In my transit through Metro North and Grand Central Station I come into contact with hundreds if not thousands of people daily. As I am prone to do, I take note of what people decided to wear. What aspects of their identity are they choosing to disclose? Is what they are wearing a cause or effect of the places they are traveling, who they are, or who they want to appear to be? Many are wearing a symbol some variety or other. What do these symbols represent? Do they wear these things for themselves to experience or for others to see? There is no doubt that this consciousnesses is a product of my choice to wear a kipah. Regardless if we realize it or not we all are communicating with the people around us with the symbols of our lives. In that sense these messages are as much for our neighbors as for ourselves. It is what we tell people about ourselves which informs our aspirations for the people we hope to become. In turn these symbols help inform our habits. These stones from this week’s Torah portion were as much billboards of the Torah on the banks of the Jordan as the t-shirt a freshman in college wears for his/her first day of college. Even if we are not about to erect a large stone monolith or a 9/11 memorial, we all could take a moment and think about the messages we send and make sure they line up with the people you want to become. We could also explore how we communicate with the land itself. I found this piece, “The art of wearable communication” by Kate Hartman, to be very compelling. While delightfully quirky, there is no doubt it takes this conversation about communication to the next level. Look who is talking now.